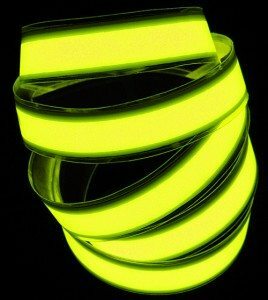 When your project calls for a lot of illumination, look no further than electroluminescent tape, which boasts an extremely thick 2″ beam of light. This electroluminescent tape makes a great light and provides enough illumination to read a book. The electroluminescent tape is the perfect addition to spice up your lackluster bar, or home project that needs a special lighting element. Using this cool lighting technology, electroluminescent tape makes it easy to produce stunning results in literally seconds. Electroluminescent Tape Kits typically come with 5′ Long x 2″ Wide Electroluminescent Tape and a 12V Adapter which plugs right into any wall socket, and require no special tools. Electroluminescent Tape is completely sealed and ready for use. Its waterproof exterior makes it perfect for areas that may get a drink spilled on it, or to accent your favorite design or decoration. Now using a split electrode technology, electroluminescent tape is brighter, takes less power and lasts longer. Expect stunning results for years to come with EL Tape which costs only pennies a month to operate. Compared even to LED Technology, electroluminescent tape uses a fraction of the power, but produces results only seen in the movies. Electroluminescent tape is great for bars, homes, offices and even bedrooms for amazing results. Similar to EL Panels, Parallel Electroluminescent Tape is essentially made from a screen printing process which sandwiches the electrodes on top of one another. Parallel electroluminescent tape can also be cut with standard household scissors to any length desired. This makes EL Tape great for costumes, accent lighting and more. They are extremely energy efficient, and last a long time up to 5,000-7,000 hours.